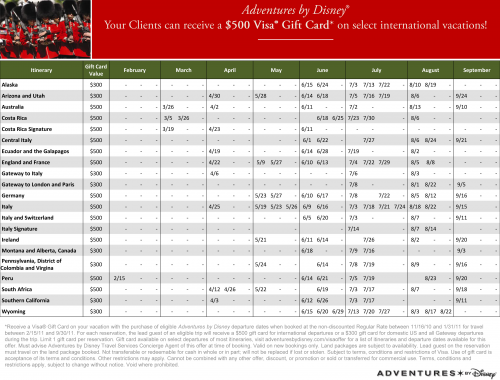 Guests booking a new Adventure by Disney vacation can receive up to a $500 VISA gift card. Only Adventures by Disney vacations can offer guests the Disney Differences – including Adventure Guides, who bring you closer to the places you visit; VIP privileges, like behind-the-scenes access; authentic cultural experiences with local experts and Junior Adventurers activities designed especially for kids. Please note there is a limit of one gift card per reservation. At this point, most dates and Adventures are available. China and Egypt have been excluded currently, and are not available. Gift card only available on new bookings, and cannot be combined with other discounts or applied to existing reservations. Available Adventures are subject to availability. Lead guest on the reservation must travel on the land package booked. Not transferable or redeemable for cash in whole or in part; will not be replaced if lost or stolen. Subject to terms, conditions and restrictions of Visa. Use of gift card is acceptance of its terms and conditions. Other restrictions may apply. Cannot be combined with any other offer, discount, or promotion or sold or transferred for commercial use. Terms, conditions and restrictions apply, subject to change without notice. Void where prohibited. For more information about this fantastic Adventures by Disney discount, please contact our sponsor Mouseketrips. Must book by January 31, 2011 to qualify.